RecipeSavants.com Invite your family to go south of the border with this scrumptious Mexican-style recipe. Load warm corn tortillas with tender, savory pork seasoned with aromatic herbs, spices & citrus juice. For a little kick, drizzle them with warm tomatillo salsa flavored with jalapeno. Ole! 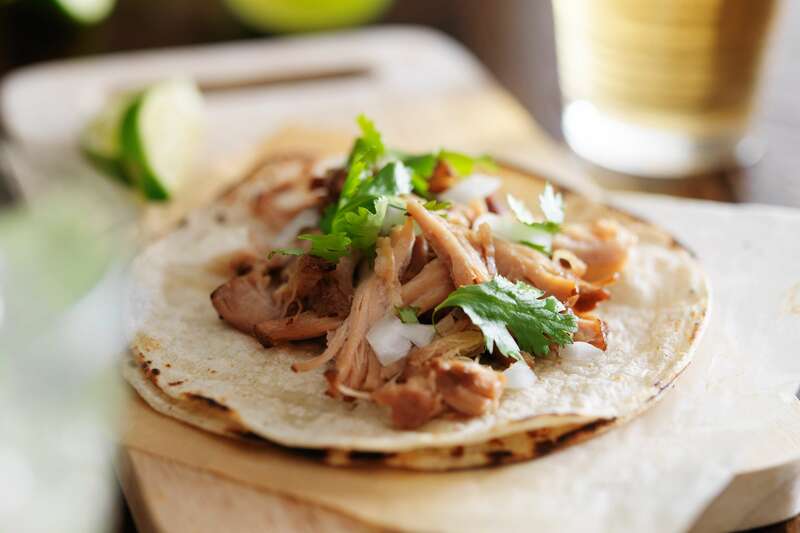 Smart Recipes, Mexican Recipes, Pork Recipes, Recipes Pork Mexican Braised Carnitas Tacos PT2H50M Serves 10 Ingredients: 0.25 Cup Lard 3 Pounds Pork Shoulder 1 Teaspoon Salt 0.75 Cup Milk 8 Cloves Garlic 0.5 Cup Pickled Jalapenos 0.33 Cup Jalapeno Pickle Brine 1 Large White Onion 2 Medium Limes 2 Medium Oranges 6 Medium Tomatillos 3 Cloves Garlic 2 Medium Plum Tomatoes 0.125 Cup Pickled Jalapeños 0.125 Cup Jalapeno Pickle Brine 0.5 Teaspoon Salt Season the cubed pork with a generous seasoning of both salt and pepper. And meanwhile, in a Dutch oven over medium-high heat, melt the lard and brown the pork shoulder for about 10-12 minutes. Stir in the milk, minced garlic, pickled jalapenos, pickling liquid, diced onion, and fruit juice. Bring to a rapid boil, and reduce the heat to medium-low and cook covered for 2 hours or until the pork is fall apart tender. 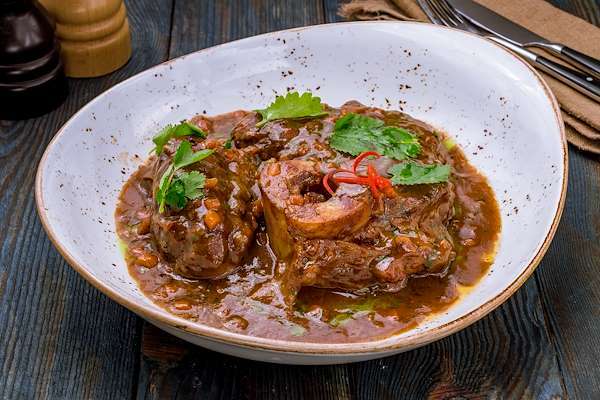 Transfer the pork to a cutting board and chop into bite-sized pieces. Meanwhile, using a fine-meshed strainer and strain the cooking liquid. Return the strained cooking liquid and chopped pork to the Dutch oven over low heat. Preheat the oven to 400 degrees. Roast the tomatillos, garlic and tomatoes in the preheated oven until slightly chared, about 15 minutes. In the bowl of a food processor, combine the charred vegetables, pickeled jalapenos, pickle brine and salt. Pulse until smooth. 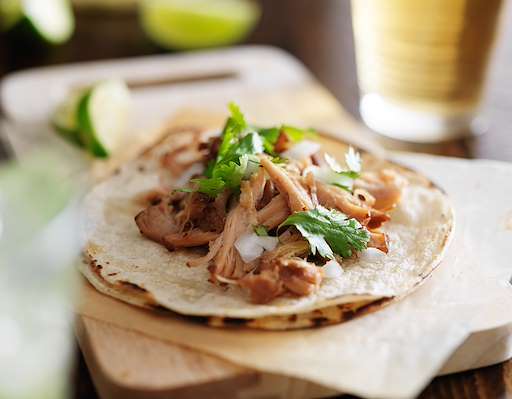 Serve the braised pork on warmed corn tortillas, with a dollop of the fresh salsa and a sprinkle of the cilantro. 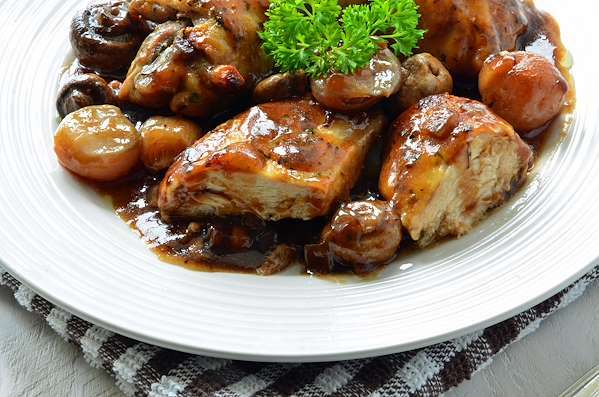 To make a traditional coq au vin, you brown the chicken, bacon and vegetables in a dutch oven first, then braise with dry red wine, chicken stock and cognac mixture and lastly bake in oven. Serve with green beans and mashed potatoes.